Trump Says He Turned Down 'Person Of The Year.' Time Disagrees. President Trump said Time told him he would "probably" be "Person of the Year," but Time doesn't appear to agree with that account. President Donald Trump and Time magazine are in disagreement over the mag's upcoming "Person of the Year" cover. Trump tweeted Friday that Time told him he would "probably" be named Person of the Year for 2017. He says he told the magazine that "probably" isn't good enough, and he would pass on the opportunity. But Time disputed the president's account. The magazine tweeted later Friday that the president is "incorrect" and that it doesn't comment on its choice until publication, which this year is Dec. 6. 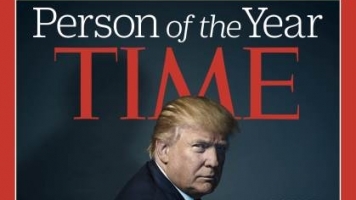 Trump was actually named Time's "Person of the Year" last year shortly after the election. The decision was controversial, sparking backlash from people on social media. Time explained its choice, saying that Person of the Year isn't a popularity contest but recognition for the year's most influential person — "for better or worse."